The history of manufacturing is summarized in Figure 13.1. – throughout the entire supply chain so as to win the marketplace. This is accomplished by synchronizing the flow of work (both internal and external to the company) to the “drumbeat” of the customer’s requirements. All kinds of waste is driven out (time, material, labor, space, and motion). The overall intent is to reduce variation and drive out waste by letting customers pull value through the entire value stream (or supply chain). Value is created by the customer. Lean starts by attempting to define value in terms of products and capabilities provided to the customer at the right time and appropriate price (see Figure 13.2). The following are summaries of key concepts used in Lean (in the context of both lean manufacturing and lean service). What are “The Eight Wastes” of Lean Manufacturing? Waiting—for information, materials, people, maintenance, etc. Poor process design—too many/too few steps, non-standardization, inspection rather than prevention, etc. Inventory—raw materials, work in progress, finished goods, papers, electronic files, etc. What are “Flow” and “Takt” Time & How are they calculated? The concept of Flow requires the rearrangement of mental thoughts regarding “typical” production processes. One must not think of just “functions” and “departments.” We need to redefine how functions, departments, and organizations work to make a positive contribution to the value stream. Flow production requires that we produce at the customer’s purchase rate and if necessary, make every product every day to meet customer’s orders, i.e., to meet the pace or “drumbeat.” The pace or drumbeat is determined by takt time. Takt time comes from the German word for meter, as in music, which establishes the pace, or beat, of the music. It is the time which reflects the rate at which customers buy one unit. 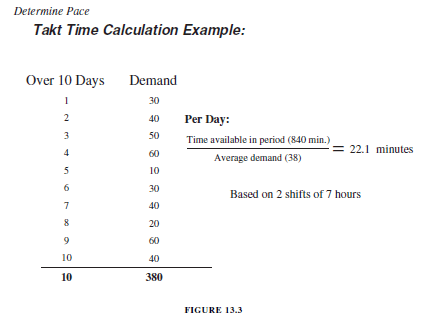 For example, in Figure 13.3, the pace or takt time is calculated for the demand shown during a 10-day period. Once takt time has been calculated, constraints (such as long setup times) should be identified and managed (or eliminated) to enable smaller batches or ideally, one piece flow, to eliminate overproduction and excess inventory. Pull production scheduling techniques are used so that customer demand pulls demand through the value stream (from supplier to production to the customer). In pull production, materials are staged at the point of consumption. As they are consumed, a signal is sent back to previous steps in the production process to pull forward sufficient materials to replenish only what has been consumed. The value stream consists of all activities required to bring a product from conception to commercialization. It includes detailed design, order taking, scheduling, production, and delivery. Understanding the value stream allows one to see value-added steps, non-value-added but needed steps, and non-value-added steps. Value-added activities transform or shape material or information to meet customer requirements. Non-valued-added activities take time or resources, but do not add value to the customer’s requirement (but may meet company requirements). The value stream improvement journey typically starts with training the team on key concepts in Lean, mapping the current state using value stream maps which document materials and information flow as well as any pertinent information on the process (such as wait times, processing times, and inventory levels). Improvements are identified. The desired future state is then documented as a future state value stream map, and the improvements are implemented to drive toward the future state goal. An example of a value stream map for a paint line for the current state and future state are shown in Figure 13.4a, b.